Take a half sheet baking pan and line with parchment paper and preheat the oven to 400F. Take the puff pastry and lightly flour it and roll it out until it reaches the size of your sheet pan. Do not make it too thin. Hint: If you want to make individual tarts, you can divide the puff pastry into quarters. 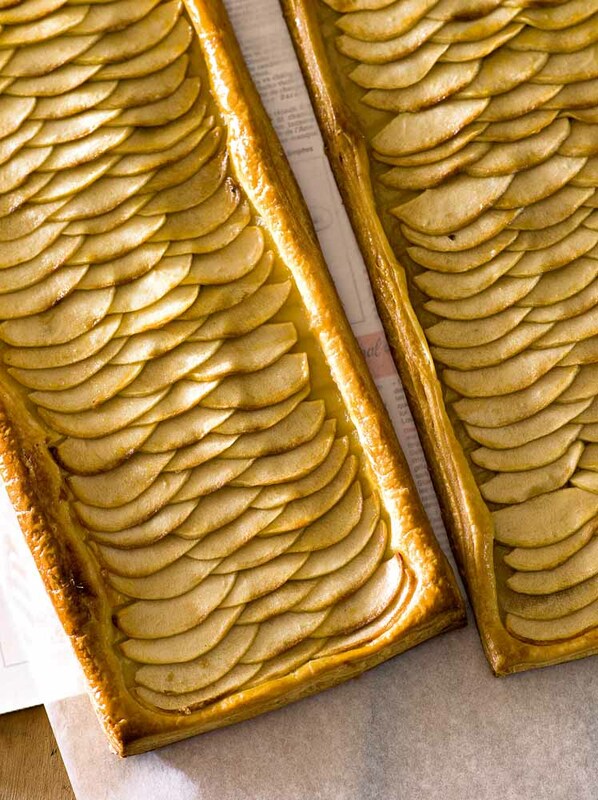 Arrange the apple slices in three rows touching each other until the apples are covering the puff pastry from end to end. Sprinkle on the sugar. Cut the Earth Balance into small squares and dot over the apples. Put into the oven for 35-40 minutes, turning once during cooking. If you find the puff pastry is bubbling up in spots, just skewer the bubble with a knife and it will deflate. While the tart is cooking, heat your apricot jam and then add your apple brandy and cook gently until it's slightly thickened. Remove form the heat, and set aside. When the tart is done, remove from the oven and spoon the apricot jam mixture over the warm tart and allow to slightly cool. Cut into squares and serve warm. Note: Ina suggests you loosen the warm tart with a spatula to keep it from sticking to the parchment paper.